There's only one thing more adorable than a little pony, and that's a little pony cartoonified No wonder they've become pop culture superstars, loved by all ages. This book puts you in the creative saddle by showing you--step by friendly step--how to dream up and draw your own, original cartoon cuties. Start off on the right hoof by building characters from basic shapes. Learn how simple proportion adjustments allow you to create whole stable of pony types. Discover secrets to mastering action and poses, so you can make your ponies walk, gallop and prance across the page. Draw ponies that shine, shimmer and show their style with unique mane and tail styles, coat colorings, brands, fashions, and accessories. Follow step-by-step instructions to create a variety of other friends--from fantastical unicorns to sweet deer, alpaca and sheep. 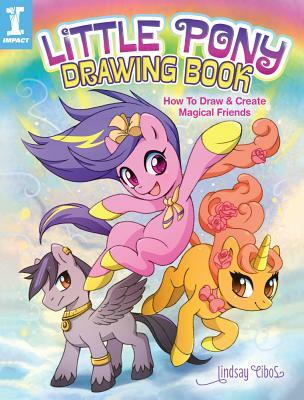 Loaded with ideas for facial expressions, costumes and fabulous flourishes, the Little Pony Drawing Book leads you on the trail to fun, friends and creative adventure.